Comm Eye Health Vol. 30 No. 98 2017 pp 31-32. Published online 07 September 2017. Research Fellow/ Public Health Optometrist International Centre for Eye Health, London, UK. Project Coordinator:Indian Institute of Public Health, Hyderabad India. Director: Indian Institute of Public Health, Hyderabad, India & Professor Public Health Eye Care & Disability, LSHTM, London, UK. Spectacle compliance is low in many school eye health programmes. There are various reasons for this, including that children do not perceive a beneficial improvement in their vision. Accurate visual acuity (VA) measurement, refraction and prescribing based on the degree of improvement in VA can also help. Children who fail visual acuity screening must undergo thorough and detailed visual acuity measurement. This is the first step in identifying those who may benefit from spectacle correction. Ideally, visual acuity measurement is done in the school immediately or very soon after vision screening. This should be done by an optometrist or a trained refractionist experienced in measuring visual acuity in children. Visual acuity measurements carried out in schools should be of the same standard as at an eye unit. The distance between the screener and the student (usually 6 metres) should be measured and marked appropriately. The student’s chair may move around, so make a mark on the floor where the front legs of the chair should be. Check that the chair is in the right place before assessing each child. If using a standard, unlit visual acuity chart, the room should be well lit, taking care to avoid reflections off the chart. Backlit charts can be used in a darkened room. Students should not be distracted by strong external sources of light. Before starting to measure visual acuity, the optometrist/ refractionist should check that the environment is correctly set up by sitting where the student will sit. Explain the test to the child. If an E chart is being used, ensure that they understand what they are being asked to do before starting to measure their visual acuity. Measure the acuity one eye at a time, usually the right eye first, then the left. If a child already wears spectacles, measure their acuity without spectacles first. Ensure that the chart is at the student’s eye level. Cover the left eye with the eye occluder or a piece of card. It is advisable that they do not use their hand as they may be able to see between their fingers. If using a tumbling E chart, point first to the 6/60 size E and ask the student to indicate which way the bars of the E point. Proceed down the chart, pointing out each E in turn, taking care not to cover any part of the E with the pointer. Follow the same procedure if using a standard letter Snellen chart. To see any particular line of the chart, the child must be able to see at least three of the five Es or letters. The smallest line accurately read is expressed as a fraction, e.g. 6/18. The upper number refers to the distance between the chart and the person being tested (6 metres), and the lower number is the line on the E or Snellen chart that the child can see. Record the VA for each eye immediately after measuring the acuity, stating whether this was tested with or without spectacle correction. If the child cannot read the 6/60 E or letter this is recorded as <6/60. Refraction should be undertaken by a competent practitioner experienced in refracting children. NOTE: Children whose visual acuity does not improve to normal with refraction must be referred for examination to determine the cause so that appropriate action can be taken. Retinoscopy, or preliminary assessment using an autorefractor appropriate for children, should be followed by comprehensive subjective refraction. Children should be referred for cycloplegic refraction if they are uncooperative, if there is a variable or inconsistent end-point to refraction, in the presence of strabismus or suspected amblyopia and if they are difficult to refract because of media opacities or irregular corneas. Before describing how to prescribe spectacles for children, it is important to understand why children may not wear their spectacles. There are simple solutions for many of these reasons. Reasons 1–5 can be addressed by health education which should include teachers, parents and all children whether they need spectacles or not. This is much higher than in other studies, conducted among children of similar ages, in which prescribing was based on the degree of refractive error found at retinoscopy. This meant that spectacles were prescribed even when some children already had good VA in one eye. These children would not notice an improvement in their vision and would be less likely to wear their spectacles. Minus powered lenses improve the VA by 2 or more logMAR (or Snellen) VA lines in the better eye or with both eyes tested together. There is esotropia or a large esophoria (and the child has some potential for normal binocular vision). There is amblyopia (and the child’s age suggests that the amblyopia is potentially treatable). There is increasing evidence that, if most children see better with spectacles than without, a higher proportion will wear them. Ideally, a sample of children who do not their wear spectacles should be interviewed to find out why they are not wearing them so that corrective measures can be put in place. 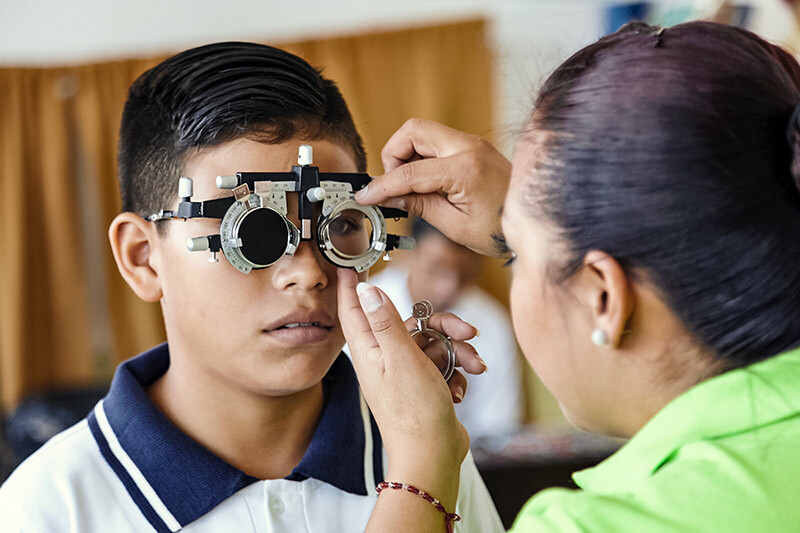 An important measure of success for any school eye health programme is the proportion of children given spectacles who subsequently wear them – it is not enough just to measure and report the number of spectacles that are dispensed. 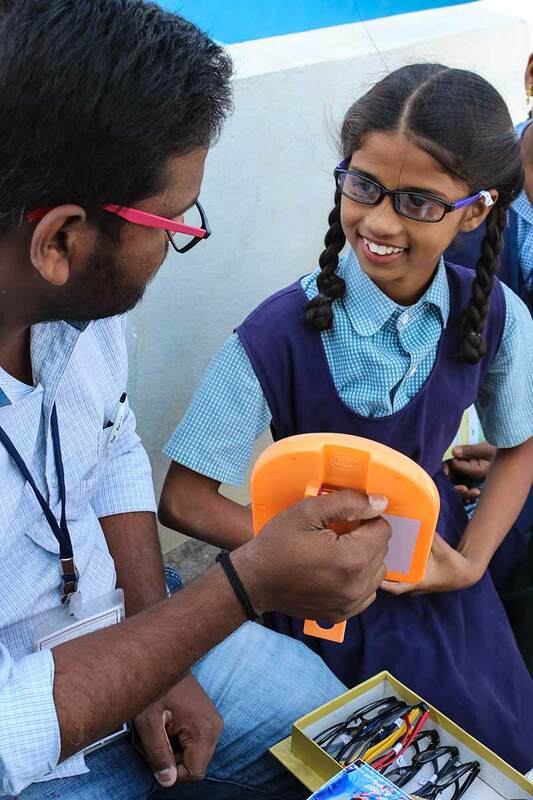 1 Morjaria P, Evans J, Murali K, Gilbert C. Spectacle Wear Among Children in a School-Based Program for Ready-Made vs Custom-Made Spectacles in India: A Randomised Clinical Trial. JAMA Ophthalmol. 2017 Jun 1;135(6):527- 533. doi: 10.1001/jamaophthalmol.2017.0641.